A Fun Survey for These Dark Times! I'm still reading so much. It's better for me than Xanax and Vicodin, which if either of those were available, believe me, I'd be gulping them down in pints. Probably both at once. The kid and I also went to see Lysistrata at the university theater last night. It was a production in modern dress, which made me a little uneasy at first, but turned out to work really well. All student actors, and almost all of them wonderful. Great comic timing, good actors, and did an excellent job bringing the hilarity of the play across the centuries. Walking back to my car, the kid said to me, "Why are the Greeks so modern? That was great!" I'm extremely fond of Jane Eyre now, though I hated it as a child and an adolescent (I was forced to read it in the 10th grade, just as my child was forced to read it last month, in AP English). And I love books that are written in response or as fan fiction, more or less, about books I love, as long-time readers of this blog might have noticed. So no surprise I gave a small squee of glee when I saw a review for this book on NPR. Also! My library had a copy. Oh boy! I didn't even have to buy it. I put in a request and had it the next day. Then I stayed up all night reading it. (Luckily it was a Friday night.) It's great. I love it at least as much as Jane Eyre, though Jane Steele is not much like Jane Eyre. The two Janes do live at about the same time, and the rough outlines of their lives -- their general plot, as it were -- are the same. They both have mean-spirited aunts, they both go off to boarding school at nine, that boarding school is run by a vicious headmaster. 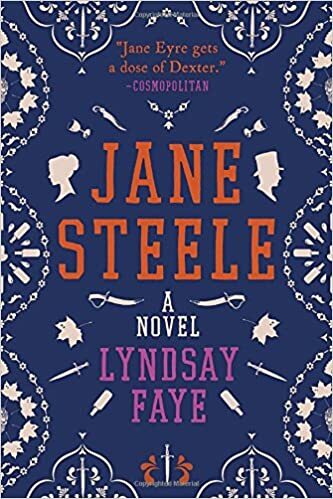 They both end up as tutors to a small foreign girl, and they both end up in love with her guardian -- Mr. Rochester in Jane Eyre's case, Mr. Thornfield, in Jane Steele's case. ...just as much as I do, here's a lovely way to waste time. The Edges2cats is especially fun. Nicole and Maggie are doing stellar work with the resistance. Read their post today -- go here. Allowing the government to create hoops that citizens have to jump through in order to vote strikes me as an impressively bad idea. Instead of having citizens who choose their government, the system allows the government to choose its citizens. The government gets to decide what tasks make people “worthy” of citizenship, but the first duty of every good citizen is to not let the state tell you what good citizenship is. It's part of a larger comment, which you may find here. Or, well, exciting for me. Y'all remember that in August 2016 I sold a story to F&SF -- well, today I got the proofs for that story, and C.C. Finley tells me it should appear in the May/June 2017 issue. The story, The History of the Invasion Told in Five Dogs, is one of my favorites; and of course I've been trying to sell a story to F&SF for, oh, I don't know, 30 years now? So yeah, I'm pleased. Look for it at your local bookstore and news stand; or you can order it online. I'll post links! Even though we're in the thick of the semester now, bearing down on midterm, I am still swallowing books whole. I think this is my way of dealing with the horrors of the Trump regime. Literary Xanax. I forget how I found this book -- maybe the NYTimes recommended list? However I found it, the rec was right. This one's excellent. Told from the point of view of the mother of five children who is also a doctor of emergency medicine when we first meet her, the writing here is great, and the characters, including of all five children, AND their friends, so well developed they all become real to us. Wonderful use of setting, also -- we move from Wisconsin to San Francisco to Thailand in the course of the novel, and Frankel gives us each place perfectly. What's it about? Yeah, that's another reason to love it. Rosie and Penn have five sons -- except their youngest son, Claude, begins telling them when he's three that he's a girl. (Penn is a stay-at-home dad and a writer, by the way, though he's not the one writing this book.) The novel deals with their struggle to understand what to do -- and not like that, they always try to do the right thing -- and to deal with the fallout of their decisions. This is a great book, and not just about having a trans kid. It's a great book about being human. This is a fact. When I hear these words* come from your mouth, or when I see them in your paper, or in your comment, or in your post, I immediately know you are arguing in bad faith, or you are incapable of honest and careful thought. I stop taking you seriously at that point -- well, in fact, I stop listening to you at all in that point. Life is too short to listen to liars and fools**. So y'all remember that they cut on me awhile back. I'm pleased to relate that I had my follow up with my surgeon (this was almost a month ago) and he "released" me, meaning unless something changes, I am cured. Also, this, which I saw at Nicole & Maggie's site. Don't despair, y'all. Take action. When we fight, we win. 1. Who are you named after? There is literally a fascist administration in office in the United States. Resist it, unerringly, with all your strength. One woman, refused entry at the airport, seeking needed medical treatment in the US has died. Another woman, scheduled to be deported, reportedly attempted suicide in the airport. The youngest child detain by our government was eleven months old. Sean Spicer, Trump’s Director of Communications, defended the detention and arrest of tiny children by claiming even five-year-olds could be dangerous.